Recently, I was working with a student who has had ongoing difficulties with her left hand, forearm, and upper arm. Apart from her pain symptoms, she described her left hand as feeling like a “clumpy sloth”, weighed down by an elephant-like heaviness, while her right hand moves relatively intuitively. Interestingly, her left side struggles to accept each new piece of information despite the comfort; the hand’s changing look as it incorporates more healthy movements seems completely foreign to her mental construct of the left hand. The disbelief continues when the right hand easily incorporates each new step which the left hand agonised over. No big deal, it was mostly there anyway. Though the hands now look the same, the right hand doesn’t look “weird” as the left hand does to her, it looks “correct”. My student has experienced her left hand as limited for so long that her expectation is that this is just how her hands are. One works just fine, the other doesn’t really. Yet when we compare both hands performing in mirror image, the differences were obvious. The left wrist was low, the non-playing fingers were not released correctly, the fingers are relaxed and heavy rather than activated, there was some five-finger positioning and small stretches, the thumb’s nail joint knuckle was collapsed, and the fingers were not supported by the forearm. The feeling of heaviness was worse on long notes, as her left hand perceived that it had time to “relax” (read slump and collapse), compared to faster passagework. When we used the right hand as a model to contrast and correct these points, the left hand suddenly “felt like a pianist’s hand”. Sometimes, we can use the healthy hand as a model for the other to learn from. Sometimes however, one hand needs very specific individual coaching. Interestingly, it is common for the more injured hand to become much more skilful than the “healthy” hand, as the movements need to be more perfect to overcome an injury. In my case, I felt like my left hand wasn’t even in the room when my injured right hand was getting all of the golden attention. Now, I understand that it wasn’t actually “healthy” or functioning “normally”, my left hand was not-quite-injured-yet with a bucketload of complex problems to be worked through after the more pressing crisis of addressing the right hand. The process of how the hands develop technically to sometimes very different abilities is fascinating to me. 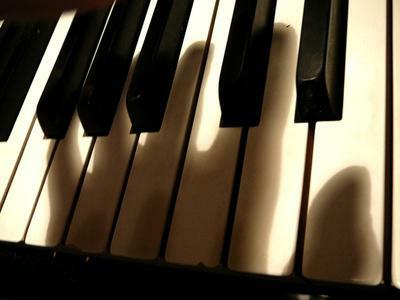 If a pianist has an intuitive instinct of how to move, their playing may have grown to a greater or lesser extent in an unconscious but coordinate manner. This may continue smoothly if the process is uninterrupted, or conversely might be abruptly halted if a teacher decides to “train” a hand, particularly when this involves positioning (ie stretching), legato octaves, a low wrist for “beautiful tone” and playing with high, isolated fingers for “strength”. Often the left hand is ignored, and develops nicely “despite” the lack of training. When intuitive pianists learn the Taubman Approach, they report that the information feels familiar but buried. Very often they can pinpoint one teacher in their pianistic history who instinctively understood some aspects of in and out, who had a knack of avoiding stretching, or had some sense of rotation, yet these concepts were mixed in with other less helpful and contradictory ideas. Highly visual learners often mimic their teacher, which works well if there is a coordinate technique, less so if there are problems in the model being demonstrated. Regardless, instinct is rarely enough, “natural” is often confused with habit. Even if one plays “naturally” beautifully, this experience is often unconscious, and does not translate to an accurate and organised way of imparting a system of development to one’s students. Rather than throwing the baby out with the bathwater and assuming everything is wrong, one learns through Taubman training to consciously identify the specific harmful movements that need to be replaced with coordinate movement patterns, while skilfully encouraging the existing strengths in the playing, whether they came to be there “naturally” or through “training”. It is important to understand that if your hands feel unequal, it is not psychological, and it is not something that you have to accept for the rest of your life. It is possible to train both hands to be strong, adept and facile. You might start by observing what your healthy hand does when your playing feels easy, free, and reliable, and play spot the difference.